History of Any Soldier Inc.
Click to become a contact! Since our beginning in August 2003, Any Marine® has become world known, and we currently support the deployed military world-wide. They need your help -- and so do we. 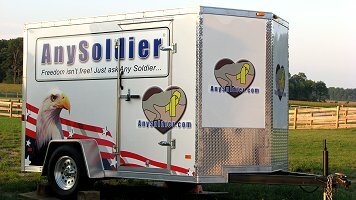 Any Soldier Inc. is in real need of donations to fund our operations and growth. 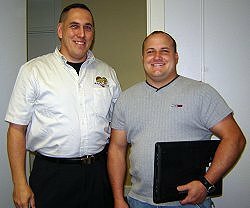 Did you know that the President of Any Soldier Inc® developed the web site by himself and runs it on a laptop AND runs it from his home? Maintaining and generating Marine contacts. 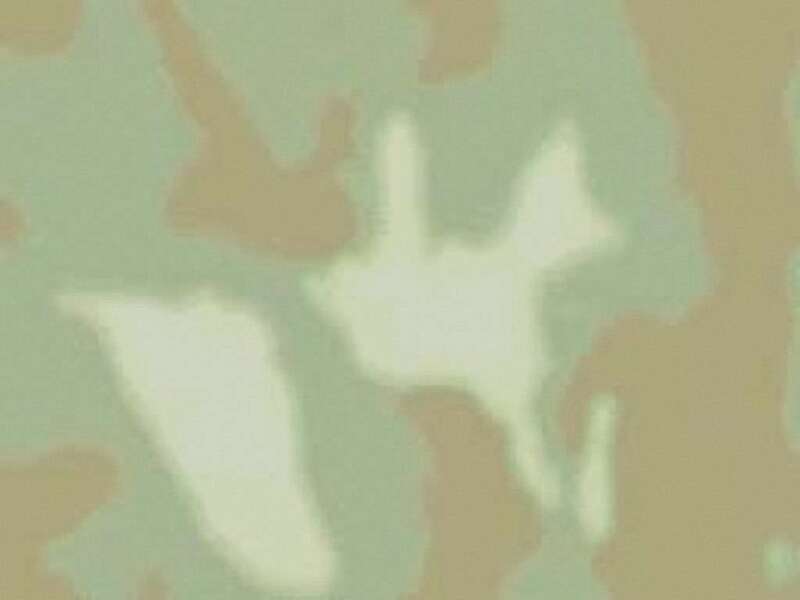 This is currently a process that we manage by word of mouth, but to make it more effective we strive to become recognized by the Department of Defense so that we have an official method to initiate cooperation with the units. We also develop additional methods to contact and support Marines who do not currently have the communications tools to be in our program. Developing effective and creative ways for you to support the Marines, including ways for you to do this in a tax-deductible fashion. Creating cooperative and useful alliances with manufacturers and distributors of items that are requested by the Marines, so our supporters online have ready and affordable access to these items. Improving delivery methods for your care packages. This includes building an ongoing relationship with the military mail systems (APO and FPO) to improve communications between these organizations and our supporters (especially improving the wording of their guidelines to avoid confusion) and working with the US Postal Service to streamline package delivery to Marines. Spreading the word about how people can support Marines and the ways Any Marine® is working to make that happen. Ongoing: Laptops, Netbooks, iPads, etc. 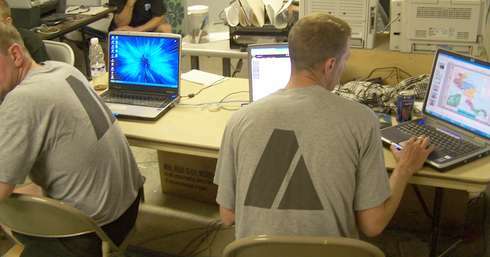 donated to JDS Computer Donations, a long-time cooperative that also uses addresses and information from AnySoldier.com to indentify, coordinate, and fulfill troop's requests for IT equipment. 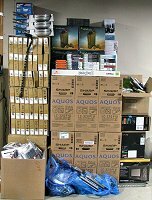 January 2010: cost $1313.31 to send a bunch of electric rechargeable shavers to Marines in southern Afghanistan who don't have running or hot water but have generators. Have sent 5,418 high quality care packages (see results HERE) aimed at the contacts who report little or no response from supporters or have had a large loss of items (such as a fire on the base). These are not your average care packages either, they are from TreatAnySoldier.com, care packages designed by troops and of the best contents available. Assisting the Wounded Warrior Battalion - East by purchasing evaluation units of automatic pill dispensers for the barracks. On 15 April 2008, Any Soldier® donated $2,500 to Nicki Nash's Run For The Warriors effort on May 17th at Camp Lejeune NC. Nicki is the wife of Marine Colonel Robert Nash, once a contact with AnyMarine.com. The "Run For The Warriors" benefits the Wounded Warriors. Hope For The WarriorsTM is a civilian organization, with 501(c)(3) non-profit status. 14 Jan 08, 10am: Gifts for the Wounded Warrior Battalion at Camp Lejeune. Thanks to the generosity of the supporters of Any Soldier Inc., particularly the folks of the "Land of the Free Foundation", Any Soldier Inc. delivered over $25,000 worth of entertainment equipment to the Wounded Warrior Battalion at Camp Lejeune. Web site by LtCol Maxwell is HERE. Marines with the Wounded Warrior Barracks, Wounded Warrior Battalion-East, Wounded Warrior Regiment, Manpower and Reserve Affairs, received a surprise visit Jan. 14, from Marty Horn, president of http://www.AnySoldier.com/, a Web site dedicated to providing support and care packages for service members. Horn and Air Force Reserve Lt. Col. Scott Remington, the support team director for the organization, arrived at the barracks with a trailer full of entertainment products and other donated items to show their appreciation for the wounded Marines and sailors. “Since the beginning, we have wanted to do something for the troops who have paid the price of combat, and for their families,” said Horn. The wounded warriors’ eyes widened as the truck was emptied. Flat screen televisions, video game systems, kitchen appliances, and laptop computers were quickly unloaded and brought to the lounge where the Marines had gathered. Horn felt very pleased at the outcome of his efforts. He had spent a long time soliciting businesses to donate money to the cause. Instead of giving the money to the Marines, he decided it would be better to buy things the Marines could enjoy. Horn’s contribution was appreciated by the senior Marines, who praised him. Horn is humbled by the appreciation, but doesn’t plan to let this event be the end. Purchased and sent digital cameras requested by Marines in Iraq. Purchased and sent $1,000 worth of LED helmet lights in cooperation with Extreme Outfitters requested by Marines in Iraq. Purchased and sent over $2,300 worth of electric shavers requested by Marines in Iraq. Sent over $1,600 worth of plumbing materials to an FOB in Iraq (HHB, 1-10 FA) so they can take hot showers. "I am the proud Army mom of Spc. 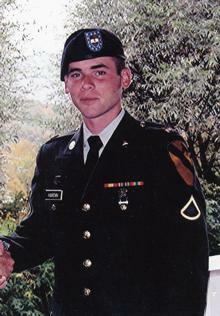 Kevin Hardin, who was seriously wounded in Samarra, Iraq on 9/30/07 while serving with the 1st Cav out of Ft. Hood, Texas. Our son was hit by a RPG (rocket propelled grenade) and he has had extensive surgeries (15 to date) to his hands and arms. 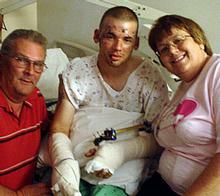 He has lost three fingers on each hand, including his thumb. The doctors are hoping that someday they will be able to fit our son with a prosthetic thumb but that is a long way down the road. Our son also suffered shrapnel to his brain and it is inoperable. My husband has lost his job to be by our son's side since the date of the accident, and we have two other young chidren at home. We have made numerous trips back and forth between South Florida where we live and Walter Reed Army Medical Center in Washington, D.C. We have been very blessed in that several organizations have helped us fly back and forth on each occasion. We have many other financial needs. Indeed, we are very, very fortunate to have our son home alive and with us. He will require many more surgeries. This was our son's first deployment to Iraq, and he is only 21 years old. His MOS was a combat medic. Our son is very brave, as are the other soldiers that serve this wonderful country of ours, and we are so grateful for any assistance anyone could provide our family." A drive was posted on the AnySoldier.com web site and a lot of money was donated, along with additional help, for this family. 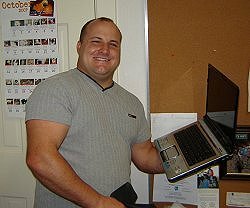 On 24 October 2007, Any Soldier® Support Team Manager LtCol Scott Remington presents Cpl Michael Savoie at the Wounded Warrior Battalion in Camp Lejeune with a badly needed computer he needs for school. Cpl Savoie was wounded 5 times in combat and is working toward a college degree. Sending a number of expensive Xboxes, PlayStations, Portable DVD Players and much more using our raffle system where the winners of the raffle pick one of our contacts to get the prize. Purchased complete computer stations for a unit so they can have a learning center. Purchased and sent 100 American flags to a unit requesting them. Purchased laptops with webcams for the patients to use in the 228th Combat Support Hospital so they can email home. Purchased 50 hats for "Doc" Heath's 1/508 Medics. Purchased a laptop for a Marine unit (3rd BN 6th MAR WPNS CO) so they can have access to email. 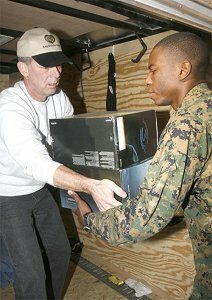 Another laptop (a full multimedia one) for a Marine unit (2nd Marines) so they can have access to email, watch DVDs, etc. The Wheelchair Story, Afghanistan, 2004. Medical Supplies in Iraq, Doc Heath, 173rd Airborne Brigade, 2003/2004. Request for Medical Supplies, Iraq, 2004. Sent multi-fuel stoves to a remote unit in Afghanistan so they could heat or cook their food. We need your help! Please consider Any Soldier Inc. as the place for your tax-deductible donation, and tell your friends and family, your contacts, your employer and anyone else you know who supports our troops. Donations TO Any Soldier Inc. ARE tax deductible, we are a 501(c)(3) organization. We accept or you can mail a . Receipts are sent for all donations of $250 or more if the donor does release contact information to us, or for any amount less if requested. Any Questions about Donations or Sales? Email us at Marty@AnySoldier.com. Copyright © 2003-2019, Any Soldier Inc.
Site owned and operated by Any Soldier Inc.